Martian features that are signs of water ice. (2019, February 5). Marspedia, . Retrieved 17:42, April 25, 2019 from https://marspedia.org/index.php?title=Martian_features_that_are_signs_of_water_ice&oldid=128561. "Martian features that are signs of water ice." Marspedia, . 5 Feb 2019, 19:11 UTC. 25 Apr 2019, 17:42 <https://marspedia.org/index.php?title=Martian_features_that_are_signs_of_water_ice&oldid=128561>. 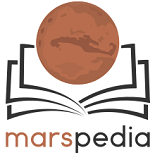 Marspedia contributors, "Martian features that are signs of water ice," Marspedia, , https://marspedia.org/index.php?title=Martian_features_that_are_signs_of_water_ice&oldid=128561 (accessed April 25, 2019). Marspedia contributors. Martian features that are signs of water ice [Internet]. Marspedia, ; 2019 Feb 5, 19:11 UTC [cited 2019 Apr 25]. Available from: https://marspedia.org/index.php?title=Martian_features_that_are_signs_of_water_ice&oldid=128561. Martian features that are signs of water ice, https://marspedia.org/index.php?title=Martian_features_that_are_signs_of_water_ice&oldid=128561 (last visited April 25, 2019).